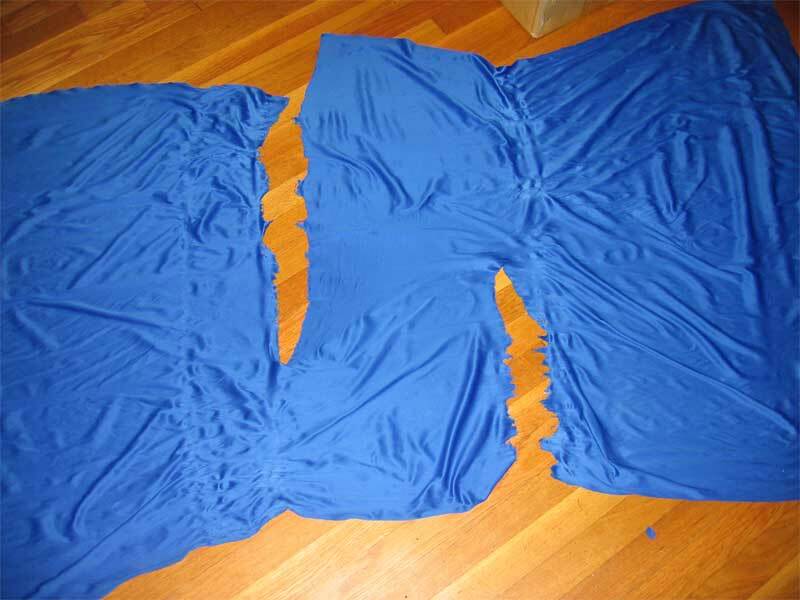 The second fabric tested was provided by Laura Witwer. This fabric had been purchased from Unicycle.fr in 2000.
age of fabric/usage: 7 years old, used in around 25 shows and literally hundreds of class hours over two years (guestimated 500 hours of class time). 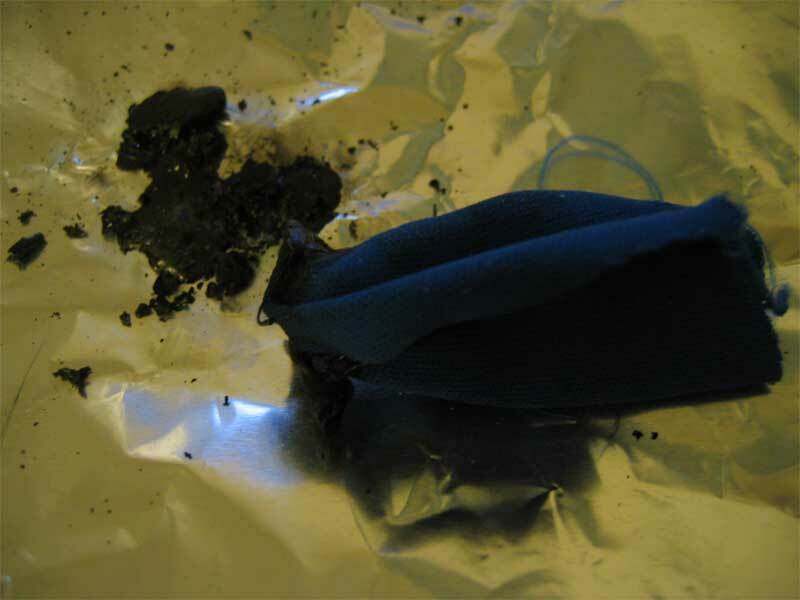 A sample of the fabric was ignited. While in the ignition source, it burned with a black smoke and smelled somewhat acrid and sweet. It dropped melted drops which hardened into a black residue. When removed from the ignition source, the sample would self-extinguish in a short time period. 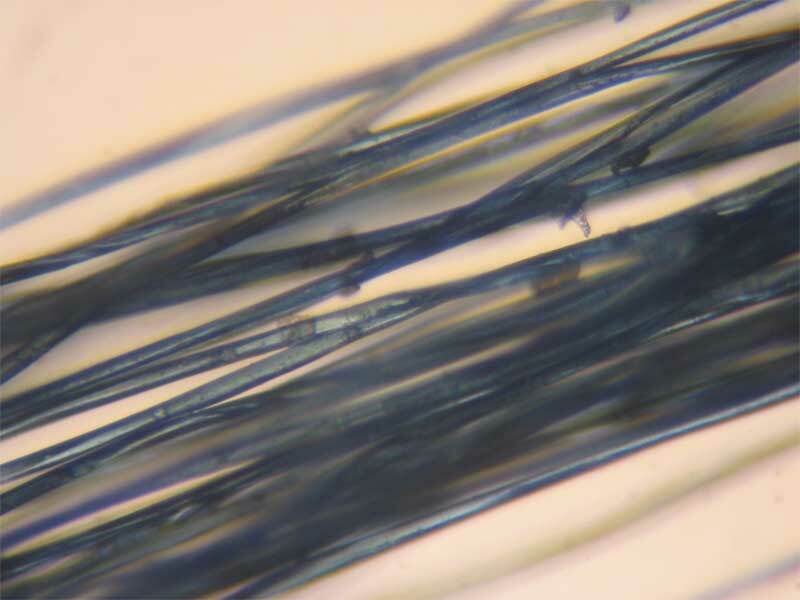 Under the microscope there seemed to be only one type of fiber. 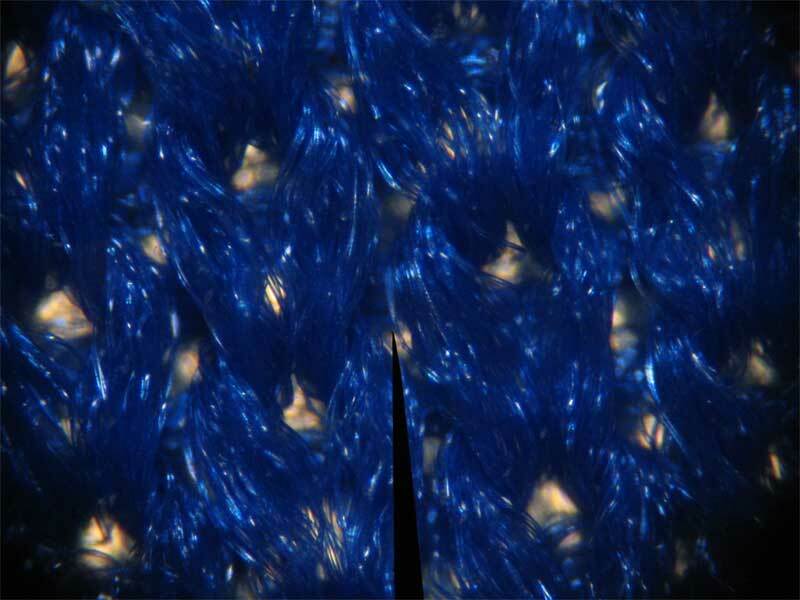 Microscope photo of fabric. The yarn is a spun type and is made of approximately 20 individual fibers. Composition of this fabric is almost certainly 100% polyester. 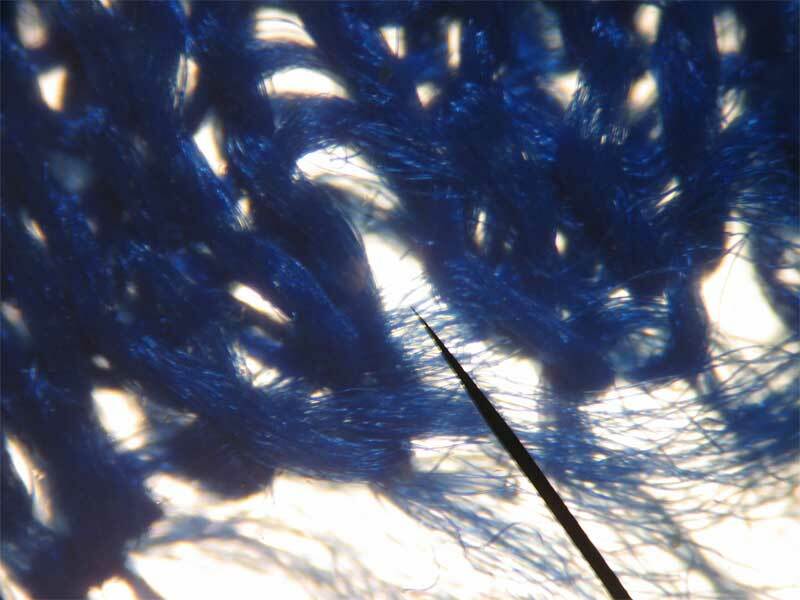 Only a single side photo is needed to determine weave type here, this one is a very simple Single Weft Knit. 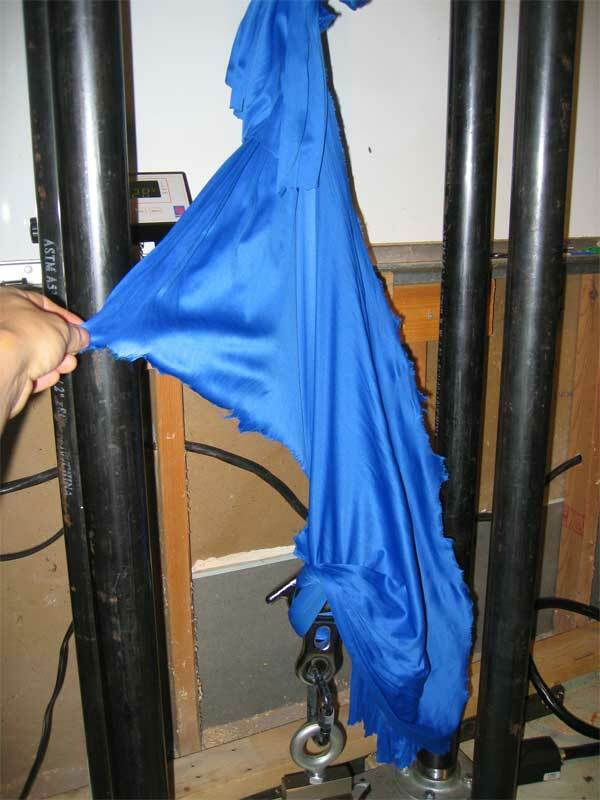 The fabric was tested to destruction using The Machine That Breaks Things, a home-brew tensile stress tester. 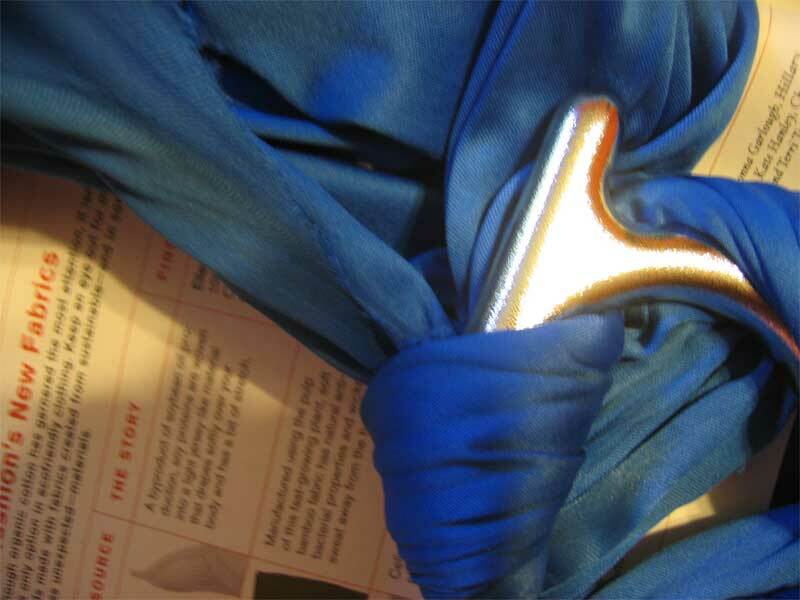 8-foot sections of the fabric bolt were taken, from various sections along the length of the fabric. 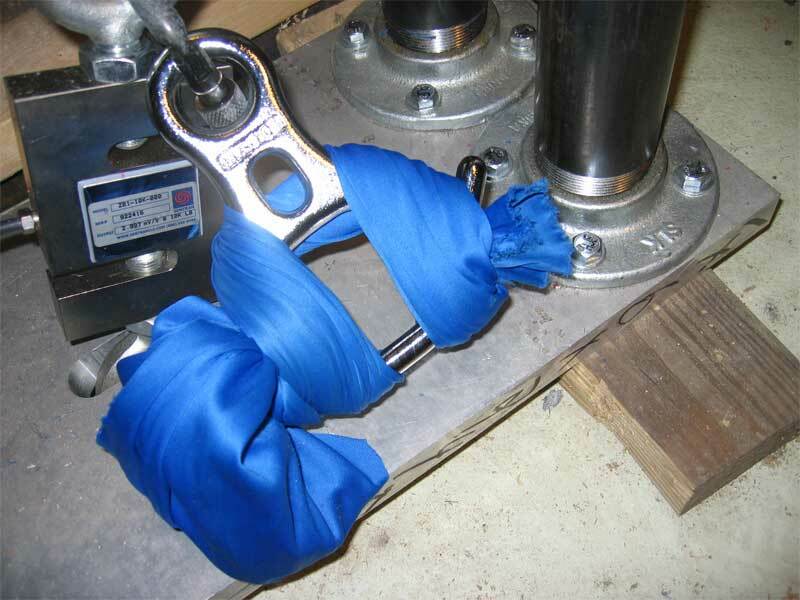 One end of the fabric was tied off to a steel caribiner (an Omega screwgate D) and the other was rigged in a commonly rigged fashion on a stainless steel Rescue 8, using a commonly used method documented Here (Aircat handout) and Here (Nimble Arts handout). 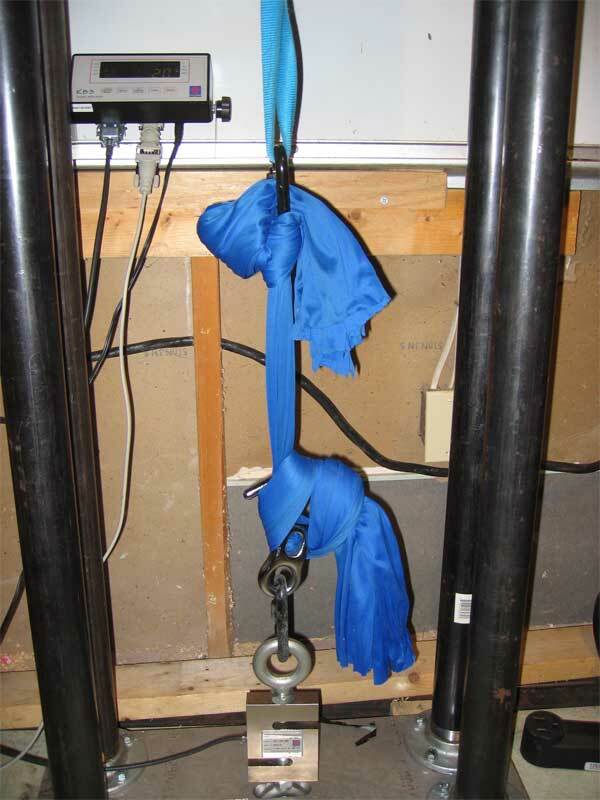 For more details on the rigging method, see the photos in the test details for Fabric #1. Note that we are only testing a single side of fabric. I wrapped the free end on the rescue-8 side through the large hole of the 8 a couple of times such that there was less free fabric lying around. OK. Lets start pulling. after an initial stressing to 300 to set everything, we start slowly increasing until either badness happens, or we reach a tension of 750. No badness was observed or heard in this cycle. 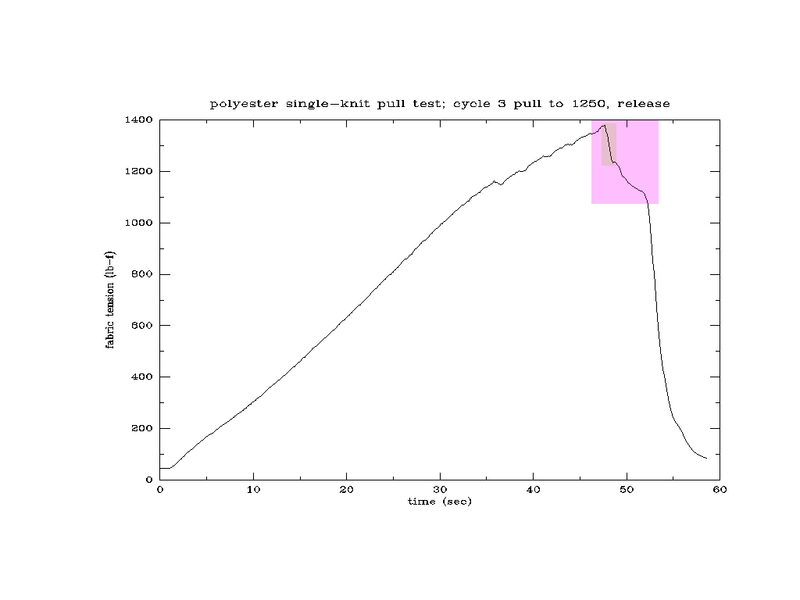 The pink rectangle highlights the region where i stopped increasing the tension in the system, but had not actively released tension yet. 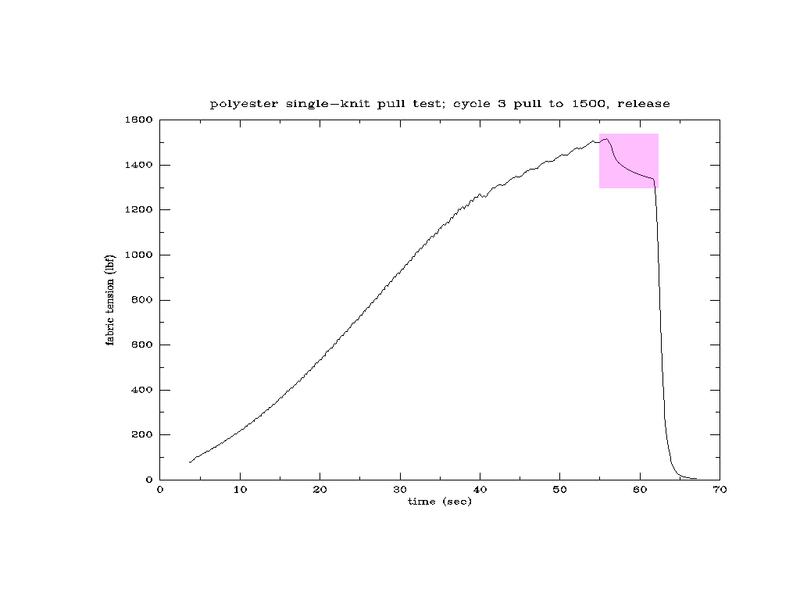 This type of fabric also seems to exhibit the same self-tension release behavior as Fabric #1, and the release curve is similarly inverse-exponential looking. Second tension cycle. We pull until we reach a tension of 1250, or until badness happens. Some creakyness is heard as we get close to 1200, but nothing really notable happened. Third tension cycle. We pull until we reach a tension of 1500, or until badness happens. A light pop is heard at about 1280 or so, but tension holds mostly steady, so we kept going. We made it to 1500, but there are noceable creaks and pops and it's clear the fabric isnt happy there. Fourth tension cycle. We pull until we reach a tension of 1500, or until badness happens. We dont make it to 1500. Noticeable badness occurs at 1430, and a noticeable rip appears in the fabric. Tension drops to 1050 or so, and then holds steady. 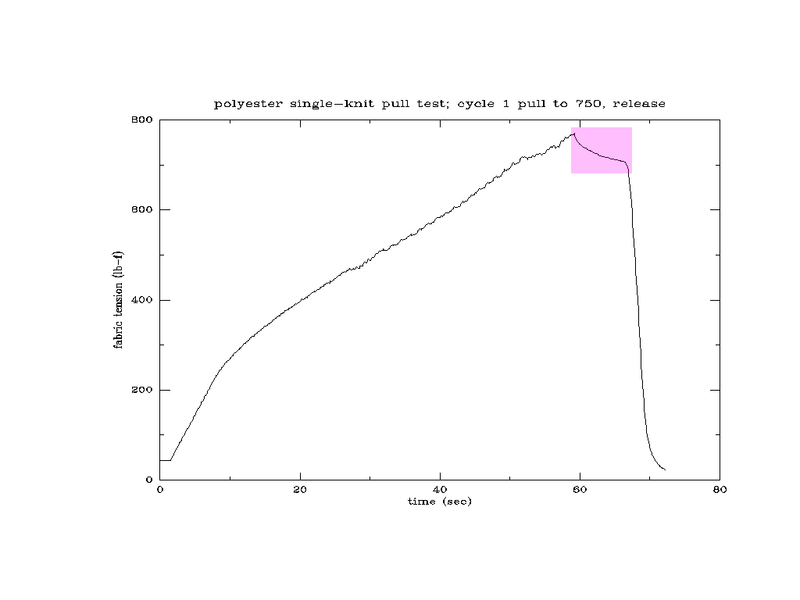 The grey rectangle within the pink rectangle shows the rip occurring. 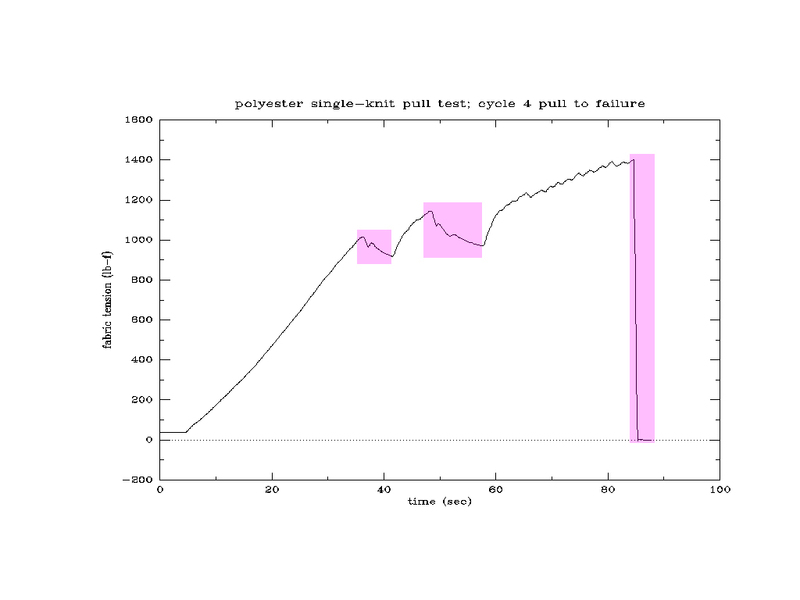 The failure is about .8 seconds in duration. We then release tension and prepare for cycle 5. Fifth tension cycle. We pull until the fabric fails completely. 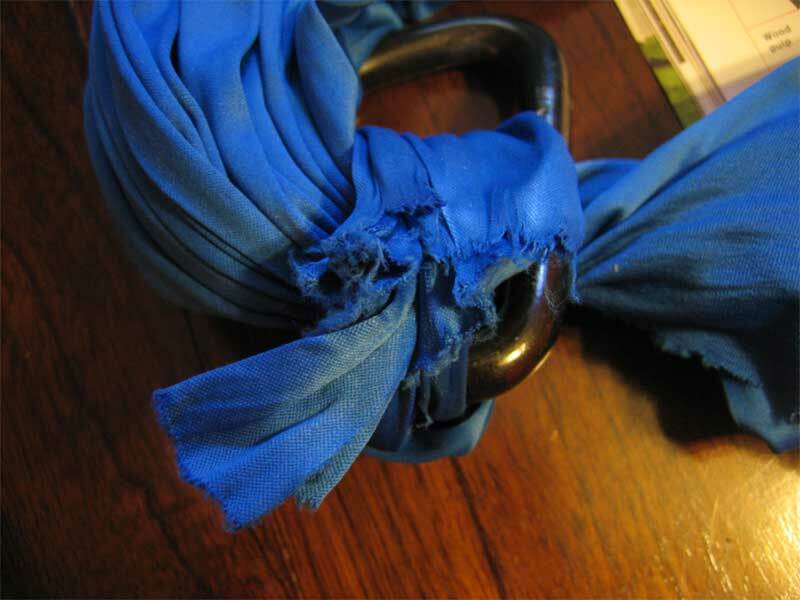 Fabric failure appeared to start from the D biner knot, though lesser damage was also seen at the 8. 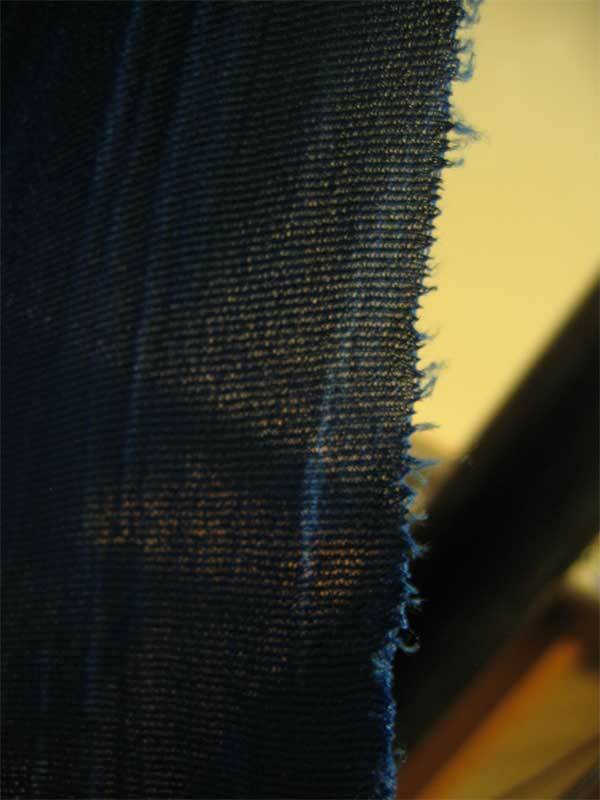 In this photo, we can see how the failure propagated directly across the weft line of the fabric. Due to the way weft knit fabrics are constructed, my suspicion is that it is much easier to have a failure propagate across the entire fabric than with a warp knit construction. In this photo, we see the fabric sample laid out flat on the floor, and can see how the failure consists of two tears directly across the weft line in separate sections. microscope shot of a section of the fabric at the rip line. cycle 1: OK up to 750.
cycle 2: OK up to 1250. Some creaky noises indicating that maybe we shouldnt stay here too long. 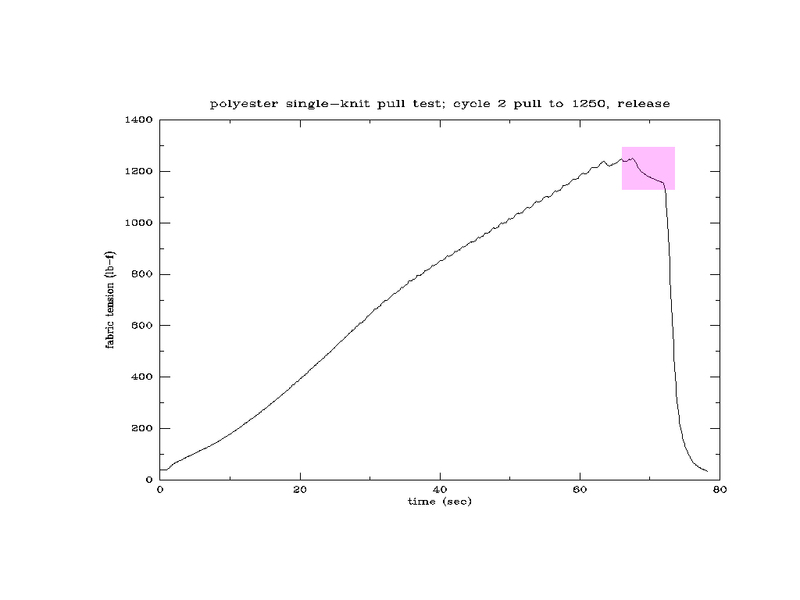 cycle 3: light pop at 1280, then OK up to 1500.
cycle 5: minor failures at at 1090, 1275, and about 1380, then complete failure at 1330. OK. Lets start pulling. after an initial stressing to 300 to set everything, we start slowly increasing until either badness happens, or we reach a tension of 750. 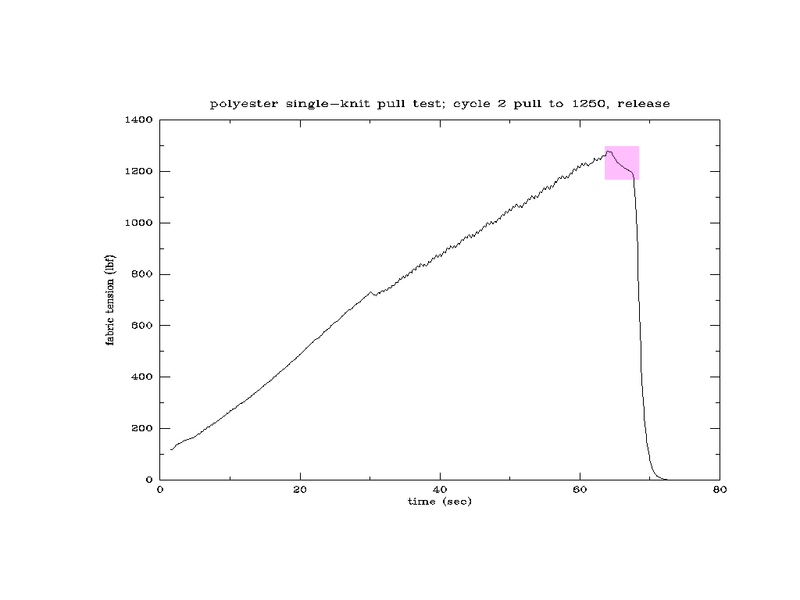 Graph of Cycle 1. Cycle 2. Pull to 1250, or until badness happens. then release. 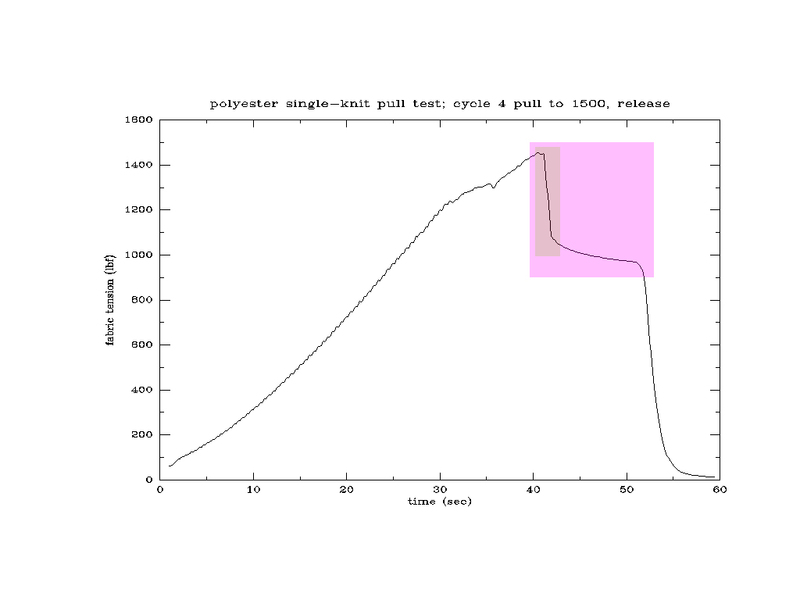 Cycle 3. Pull to 1500, or until badness happens. then release. 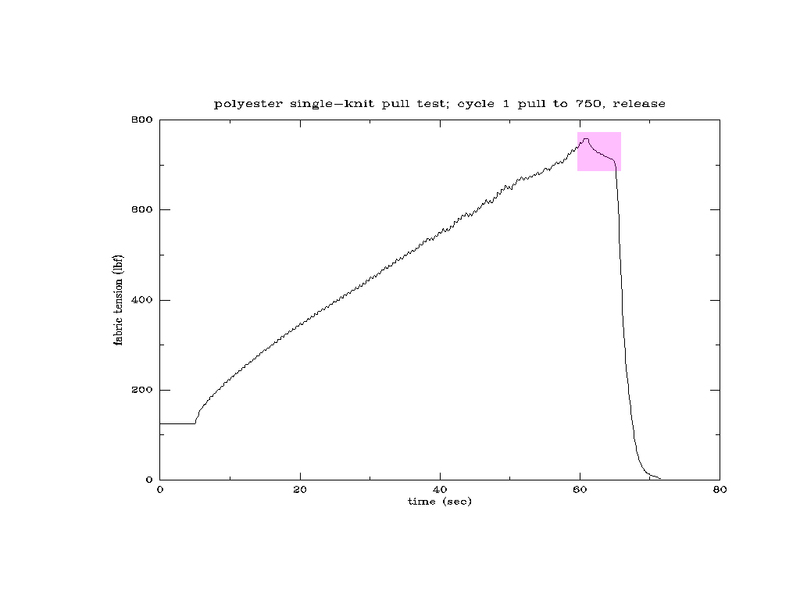 Fabric sustains a failure at 1346, tension stabilizes at about 1100. tension released and we move on to cycle 4. 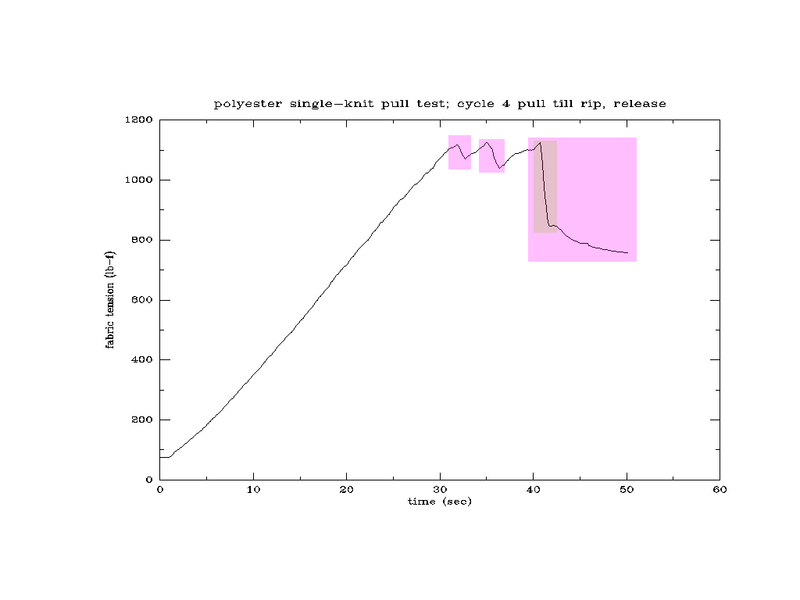 Cycle 4. Pull to 1500, or until badness happens. then release. 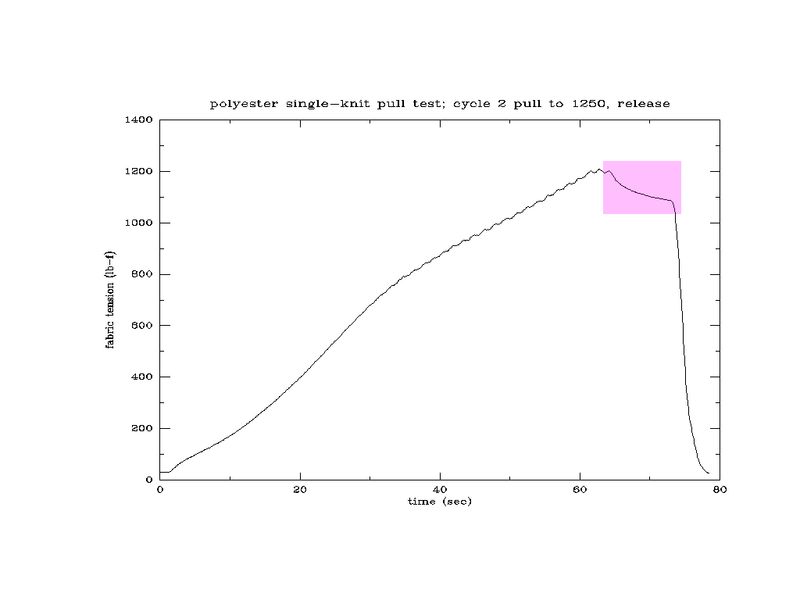 cycle 2: OK up to 1250.
cycle 3: partial failure at 1346, tension dropped to 1100 and held steady. 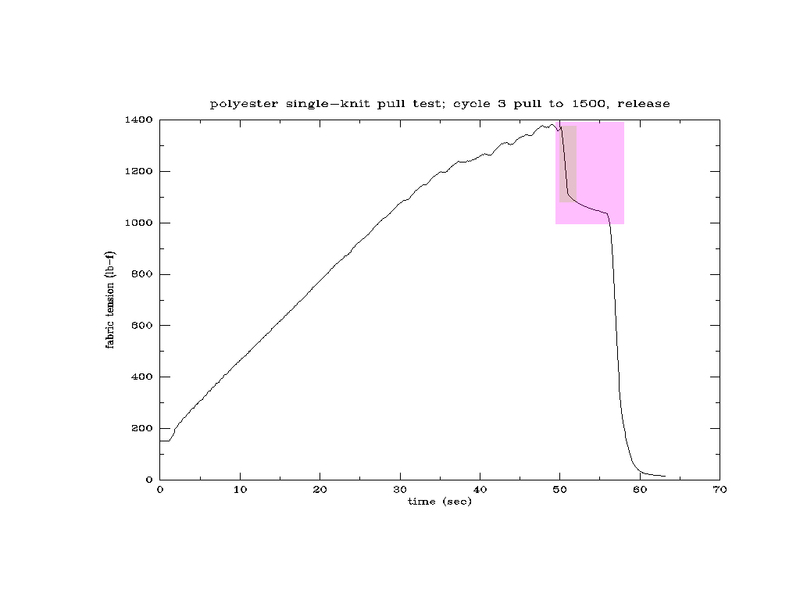 cycle 4: partial failures at at 1000 and 1100, then complete failure at 1400. Cycle 1; pull till 750, release. Cycle 5. Pull until failure. 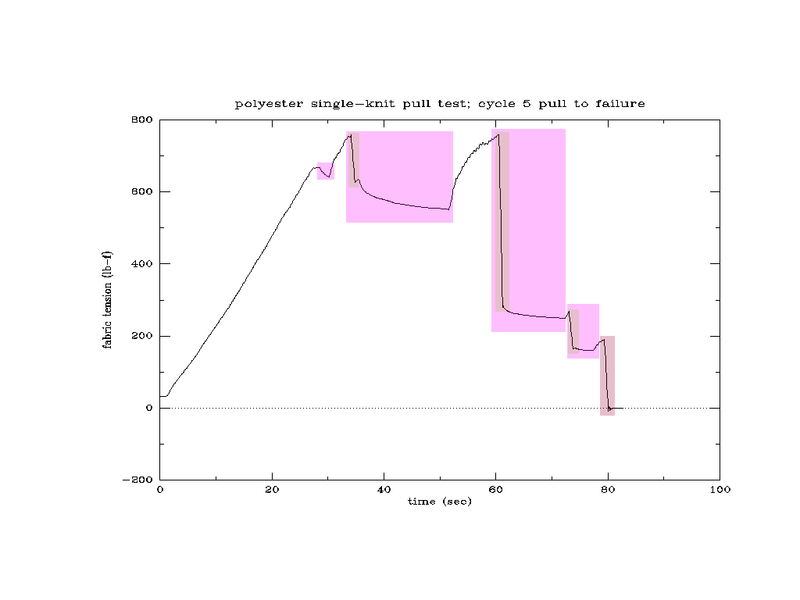 cycle 4: two partial failures at 1100, stabilizing at 750.
cycle 5: two failures at 750, followed by complete failure at 200. Once again, the fabric gave plenty of warning before complete failures occured. 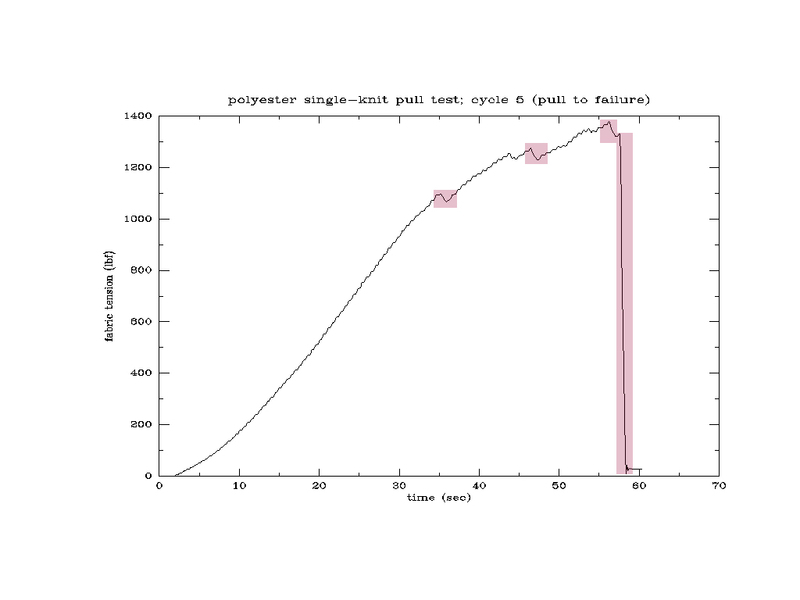 Note, however, that this fabric failed at significantly lower tensile stress than the tricot samples of Fabric #1. It also sustained fewer noticeable failures before completely breaking in two. 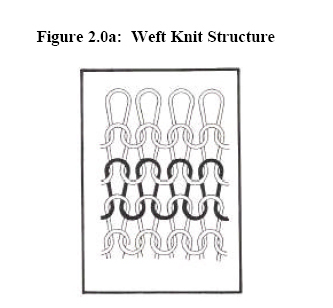 It might be tempting to look at the figures and claim that the safety margin of a fabric of this weave type is 50% of the margin you would get with a warp knit such as fabric #1, but that does not take into account the extra wear on this fabric, or that two samples does not an ironclad case make. 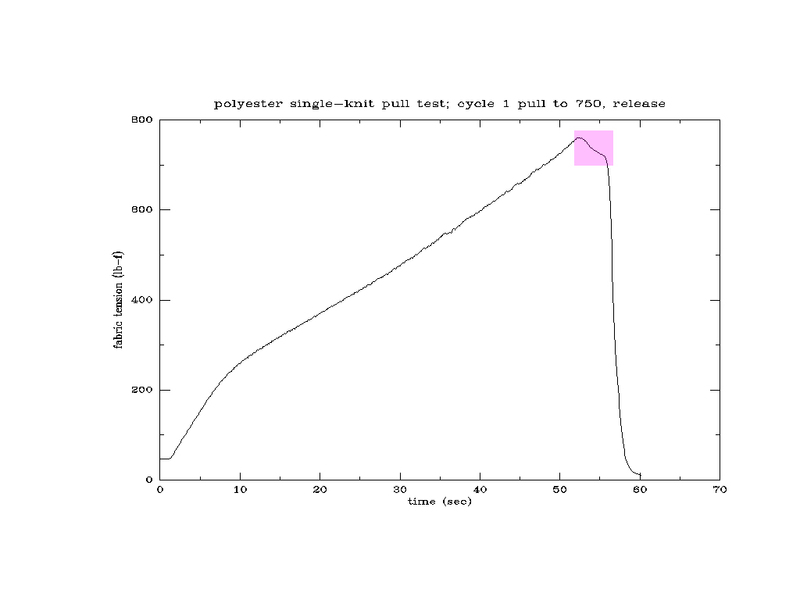 More importantly, that also wouldn't take into account the fact that any given drop performed under identical conditions, the only difference being which of the two fabrics it was done on, would produce less tensile stress on this fabric than the previous Tricot sample; that's exactly *why* folk choose "medium stretch" fabrics at times; they're easier on the body for those longer drops. Whether that difference is enough to make up for the strength difference is a question for further investigation. 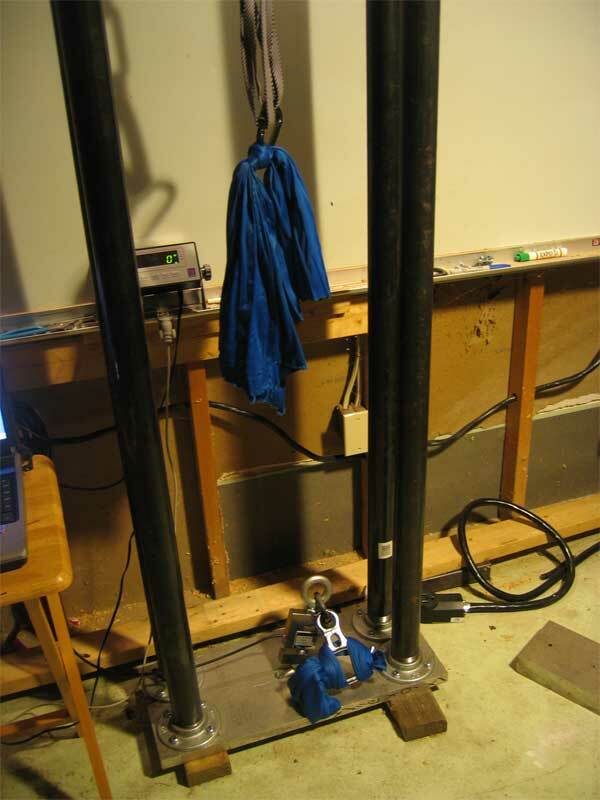 Testing apparatus for such investigations is currently under construction.